Do you know that you can make money from recycling your mortgage debt? First of all, a mortgage on your property should generally be considered a good debt. Based on information from the Reserve Bank of Australia, Australia's total household debt now stands at $1,089 billion by September 2008 in real terms, that is about $52,000 for every Australian. Most debt was incurred to buy houses. Debt for investor housing and debt for owner occupier housing were 27% and 59% of all debt in September 2008. Do you ever think that by recycling your home loan debt you can actually improve your financial position? If you have equity in your home or other assets you can borrow against the value of these to purchase investments such as managed funds and shares. The interest charged on these types of loans is tax deductible. This debt recycling strategy can help to reduce tax and generate investment income. This free mortgage debt recycling calculator can show what kind of return rate you need to achieve in order to generate income and how much you can get if you decide to recycle your mortgage. 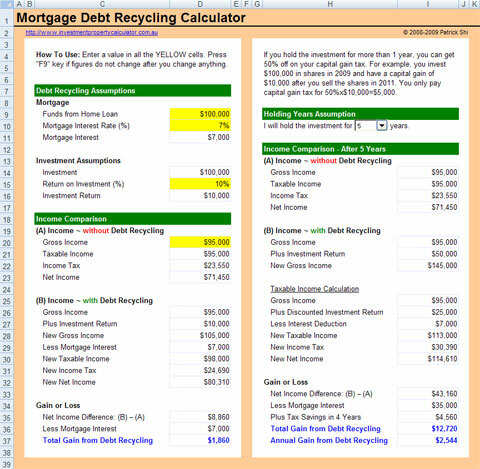 Here is a screen shot that will give you a better idea that what you need to do and what this free Mortgage Debt Recycling calculator can tell you. Please note there is risk involved in borrowing against your home and risk associated with investing. Therefore, it is very important to consult your wealth adviser prior to taking any financial decisions. 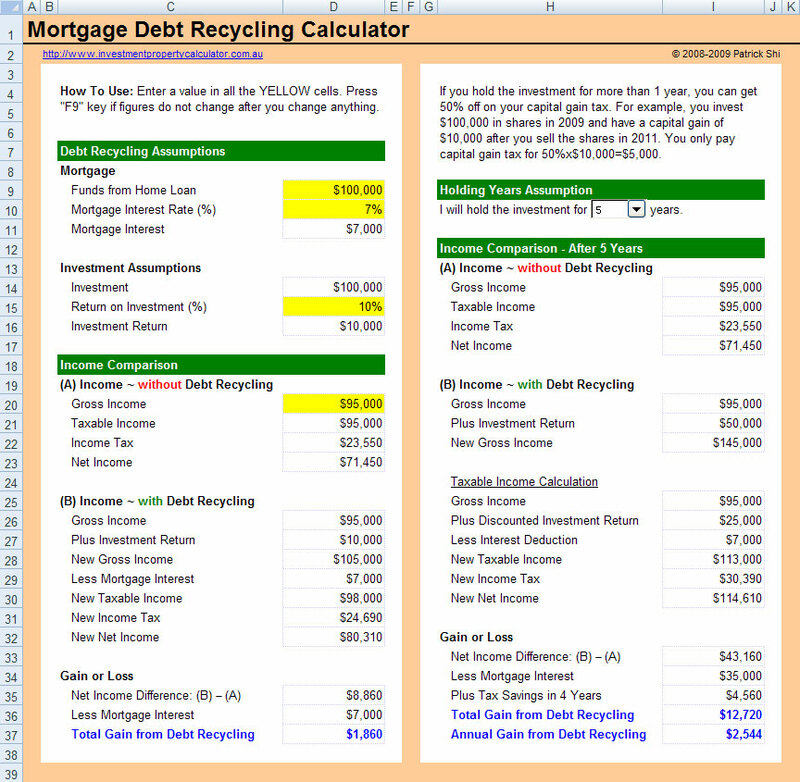 Download FREE Mortgage Debt Recycling Calculator Now!